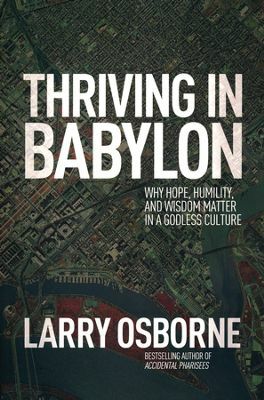 In his book “Thriving in Babylon,” bestselling author, Larry Osborne introduces a new perspective on the character, writing, and the incredible spiritual influence of the prophet Daniel in the midst of the godless culture and society of ancient Babylon, known for its wickedness, evil, and debauchery. He parallels this with a challenge for Christians today to become a positive influence for change in a culture and society comparable to a modern day Babylon. Although Osborne alludes to the well-known courage of Daniel, his deliverance from the lion’s den, and the important prophecies found in his writings, his emphasis is on Daniel’s hope, humility, and wisdom in carrying out God’s purpose for his life. Larry Osborme is senior pastor of the North Coast Church in Oceanside, California and a best-selling author. North Coast Church is among the top 10 most influential churches in America. His writing is clear, credible timely, articulate, and packed with personal application. “Thriving in Babylon – Why Hope, Humility, and Wisdom Matter in a Godless Culture” contains a message for every Christian today seeking to make a positive impact on our culture by introducing the relevancy of the gospel message in the midst of the spiraling downward trend in Biblical core values in the world today. I knew I was going to enjoy this reading adventure right from the start. Deirdre Maloney challenges traditional expectations in balancing a career, life partnering, family life, other relationships, and personal fulfillment. Her book “Bogus Balance – Your Journey to Real Work/Life Bliss” is divided into three sections. Maloney found herself caught up in the frenzied and hectic trap of busyness. She invites the reader to join her in her journey to discover a centered balance and the excitement of wholehearted energizing contentment – Bliss. Specific lessons and stories are the result of pointers taken from interviews with select “Blissfuls” through choices that changed the course of their lives. I found the chapters dealing with being true to self, and the process of discovery and taking intentional action steps especially practical and helpful. The “Bliss Builder Exercises” provide suggestions for integrating self-reflective and interactive responses. “Bogus Balance” is an important book of anyone “super stressed out,” intense, aggressive, and “super miserable” in the rat race of busyness.